Engelberg, (in the Central region) a stand alone, classic ski resort with 1000 years of history, and an all year round population of 4,000 but with fairly uninspiring architecture, but with spectacular mountain scenery, is a large, snow sure (due to Titlis glacier) resort with 24 lifts (2 gondolas/7 cable cars/funiculars, 8 chair lifts, 7 surface lifts) that offers skiers an incredible 2100 metres of vertical descent. 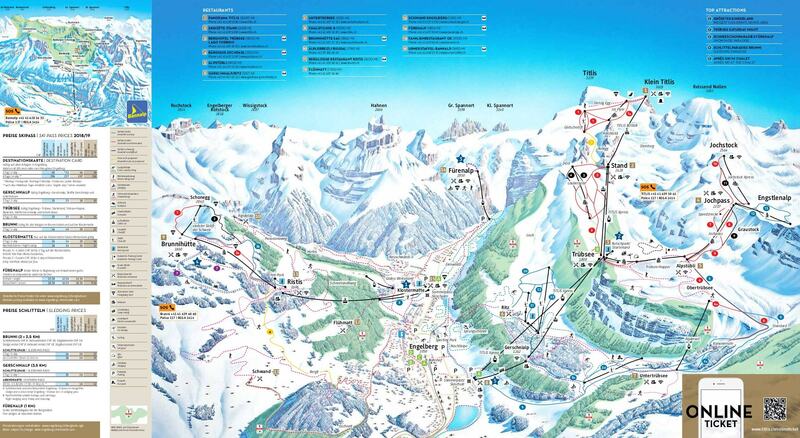 Engelberg has 200 acres of pisted terrain, with 25 runs over a total length of 82 kilometers. Most of Engelberg's pistes are above 1800 metres and best suited to intermediate skiers and snowboarders, with some terrain lower down for beginners. However, Engelberg has deliberately left much of its terrain un-pisted, making the resort especially popular with powder skiers and snowboarders. Much of the off-piste is easily accessible and perfect for confident intermediates, while for advanced and expert skiers and snowboarders there are cliffs, couloirs and genuinely extreme terrain. There are 36.5 kilometers of cross country ski trails.For snowboarders, there is a terrain park. About 40% of the pistes at Engelberg are covered by snowmaking. The closest airports are at Zurich and Basel, each with a transfer time of 1.5 hours by road. There are rail services from Zurich airport to the resort and Engelberg can be reached by rail from most parts of the country. Engelberg is not a purpose built resort and there is limited accommodation located close to the pistes. There?s lots to do here besides winter sports, which is a good thing as the slopes ? although offering some wonderfully long descents - are not extensive compared to some of the bigger areas in the Alps, and are fragmented across several areas, so those in search of endless kilometres of piste might be best to look elsewhere.